In this study, we propose a model and an adaptive backstepping tracking control method for omnidirectional rehabilitative training walker. The aim of the study is to design a stable tracking controller that can guarantee accurate tracking motion of the omnidirectional walker considering the interaction forces of the user and walker. A novel fuzzy model identification method was proposed to describe the interaction forces by using the reduced values of tracking performance. Further, an adaptive backstepping controller was developed to compensate the interaction forces on the basis of the identified model and adapt the change of user’s mass. The asymptotic stability of the trajectory tracking error and the velocity tracking error were guaranteed. As an application, simulation and experiment results were provided to illustrate the effectiveness of the proposed design procedures. P. Sun, W. Zhang, S. Wang, and H. Chang, “Interaction Forces Identification Modeling and Tracking Control for Rehabilitative Training Walker,” J. Adv. Comput. Intell. Intell. Inform., Vol.23, No.2, pp. 183-195, 2019. W. Meng, Q. Liu, and Z. Zhou, “Recent development of mechanisms and control strategies for robot-assisted lower limb rehabilitation,” Mechatronics, Vol.31, pp. 132-145, 2015. W. Huo, S. Mohammed, and J. C. Moreno, “Lower limb wearable robots for assistance and rehabilitation: a state of the art,” IEEE Systems J., Vol.10, No.3, pp. 1068-1081, 2016. J. 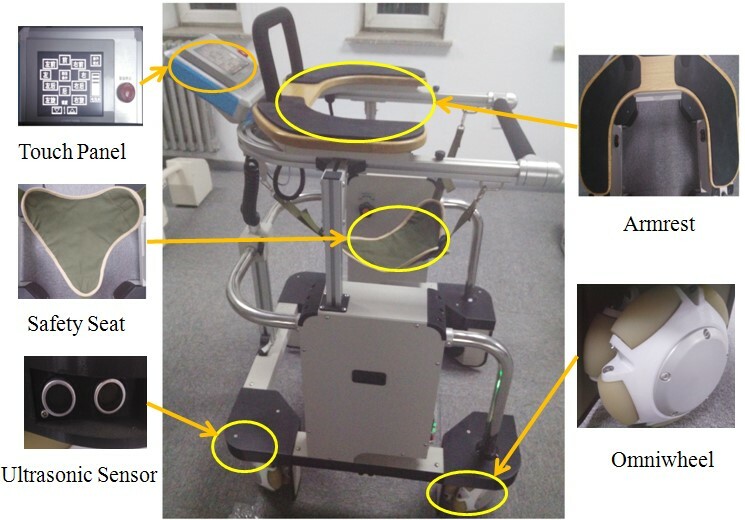 A. Saglia, N. G. Tsagarakis, and J. S. Dai, “Control strategies for patient-assisted training using the ankle rehabilitation robot,” IEEE/ASME Trans. on Mechatronics, Vol.18, No.6, pp. 1799-1808, 2013. D. Yun, A. M. Khan, and R. J. Yan, “Handling subject arm uncertainties for upper limb rehabilitation robot using robust sliding mode control,” Int. J. of Precision Engineering and Manufacturing, Vol.17, No.3, pp. 1799-1808, 2016. A. U. Pehlivan, F. Sergi, and M. K. O’Malley, “A Subject-Adaptive Controller for Wrist Robotic Rehabilitation,” IEEE/ASME Trans. on Mechatronics, Vol.20, No.3, pp. 1338-1350, 2015. C. L. Jones, F. Wang, and R. Morrison, “Design and development of the cable actuated finger exoskeleton for hand rehabilitation following stroke,” IEEE/ASME Trans. on Mechatronics, Vol.19, No.1, pp. 131-140, 2014. Z. Wu, F. Li, and W. Mi, “Robust controller design for the cooperative control of lower extremity rehabilitation robot,” Int. J. of Control & Automation, Vol.7, No.4, pp. 313-328, 2014. G. Chen, Z. Zhou, and B. Vanderborght, “Proxy-based sliding mode control of a robotic ankle-foot system for post-stroke rehabilitation,” Advanced Robotics, Vol.30, No.14, pp. 992-1003, 2016. S. Song, X. Zhang, and Z. Tan, “RBF neural network based sliding mode control of a lower limb exoskeleton suit,” J. of Mechanical Engineering, Vol.60, No.6, pp. 437-446, 2014. M. E. Daachi, T. Madani, and B. Daachi, “A radial basis function neural network adaptive controller to drive a powered lower limb knee joint orthosis,” Applied Soft Computing, Vol.34, pp. 324-336, 2015. P. Sun, “Backstepping compensation tracking control for omnidirectional rehabilitative training walker with velocity constraints,” Information and Control, Vol.44, No.3, pp. 309-315, 2015. M. Mazare, M. Taghizadel, and M. R. Najafi, “Kinematic analysis and design of a 3-DOF translational parallel robot,” Int. J. of Automation and Computing, Vol.14, No.4, pp. 432-441, 2017. C. Ma, H. Qiao, R. Li, and X. Q. Li, “Flexible robotic grasping strategy with constrained region in environment,” Int. J. of Automation and Computing, Vol.14, No.5, pp. 552-563, 2017. D. M. Ka, C. Hong, and T. H. Toan, “Minimizing Human-exoskeleton Interaction Force by Using Global Fast Sliding Mode Control,” Int. J. of Control Automation and Systems, Vol.14, No.4, pp. 1064-1073, 2016. V. Khoshdel, “Voltage-based adaptive impedance force control for a lower-limb rehabilitation robot,” Advanced Robotics, Vol.29, No.14, pp. 961-971, 2015. X. Chen, Y. Zeng, and Y. Yin, “Improving the transparency of an exoskeleton knee joint based on the understanding of motor intent using energy kernel method of EMG,” IEEE Trans. on Neural Systems & Rehabilitation Engineering, Vol.25, No.6, pp. 577-588, 2017. H. B. Chang, P. Sun, and S. Y. Wang, “A robust adaptive tracking control method for a rehabilitative walker using random parameters,” Int. J. of Control, Vol.90, No.7, pp. 1446-1456, 2017. H. B. Chang, P. Sun, and S. Y. Wang, “Output tracking control for an omnidirectional rehabilitative training walker with incomplete measurements and random parameters,” Int. J. of System Science, Vol.48, No.11, pp. 2509-2521, 2017. J. Zhou, C. Y. Wen, and G. H. Yang, “Adaptive backstepping stabilization of nonlinear uncertain systems with quantized input signal,” IEEE Trans. on Automatic Control, Vol.59, No.2, pp. 460-464, 2014. J. Davila, “Exact tracking using Backstepping control design and high-order sliding modes,” IEEE Trans. on Automatic Control, Vol.58, No.8, pp. 2077-2081, 2013. R. C. Ma, G. M. Dimirovski, and J. Zhao, “Backstepping robust H-infinity control for a class of uncertain switched nonlinear systems under arbitrary switching,” Asian J. of Control, Vol.15, No.1, pp. 41-50, 2013. P. Sun and S. Y. Wang, “Guaranteed cost non-fragile tracking control for omnidirectional rehabilitative training walker with velocity constraints,” Int. J. of Control, Automation and Systems, Vol.14, No.5, pp. 1340-1351, 2013. P. Sun and S. Y. Wang, “Redundant input safety tracking for omnidirectional rehabilitative training walker with control constraints,” Asian J. of Control, Vol.19, No.1, pp. 116-130, 2017. M. Y. Cui, Z. J. Wu, X. J. Xie, and P. Shi, “Modeling and adaptive tracking for a class of stochastic Lagrangian control system,” Automatica, Vol.49, No.3, pp. 770-779, 2013. Y. M. Li, S. C. Tong, and T. S. Li, “Adaptive fuzzy out-feedback control for output constrained nonlinear systems in the presence of input saturation,” Fuzzy Sets and Systems, Vol.248, pp. 138-155, 2014. R. P. Tan, S. Y. Wang, and Y. L. Jiang, “Adaptive control method for path-tracking control of an omni-directional walker compensating for center-of-gravity shifts and load changes,” Int. J. of Innovative Computing, Information and Control, Vol.7, No.7, pp. 4423-4434, 2011. S. M. Ahmadi and M. M. Fateh, “Robust control of electrically driven robots using adaptive uncertainty estimation,” Computers and Electrical Engineering, Vol.56, pp. 674-687, 2016.